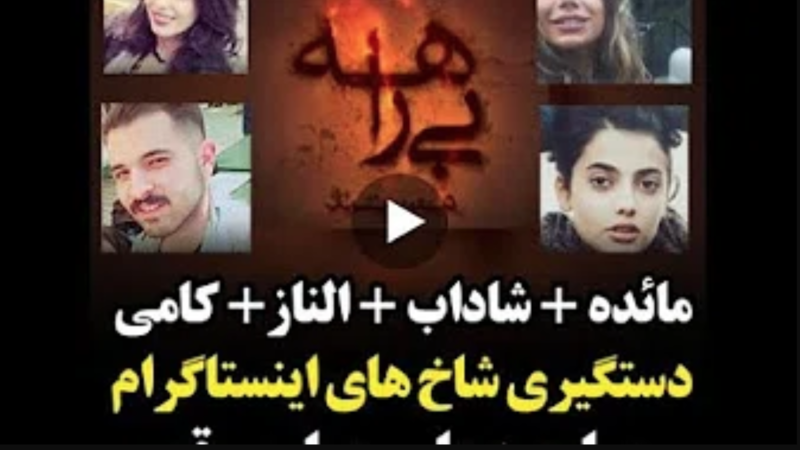 A screenshot of the Islamic Republic of Iran Broadcasting (IRIB)'s documentary that aired the forced confessions of the detainees they called “Instagram celebrities,” including the 18 year old Maedeh Hojabri. This article was written by Mahsa Alimardani for ARTICLE19. You can see the original ARTICLE19 statement here . When the high-profile Iranian Instagram users Maedeh Hojabri, Elnar Ghasemi, Shadab Shakib and Kami Yousefi were arrested in May 2018, it signaled a new phase in state efforts to control expression on Instagram. The arrests of these high profile Instagram users sparked a worldwide outcry after the government forced the 18-year-old Hojabri to confess to the “crime” of posting videos of herself dancing. Tension around Instagram has been mounting since the start of 2018, when protests spread across the country and Iranian authorities temporarily blocked online platforms Instagram along with Telegram. Both sites are extremely popular in Iran. By the end of April, Telegram was fully blocked — but Instagram remained open. Instead of blocking the platform, it appears that authorities are instead using it to track the activities of Iranians, and control Instagram content by arresting those who are not following the laws of the land. The judiciary began threatening to filter Instagram at the beginning of July 2018, arguing that it has enabled the “illicit activities” of so-called Instagram celebrities. Hojabri had been inactive on social media since May — but her fate was unknown until 9 July, when the Islamic Republic of Iran Broadcasting (IRIB) TV network aired a forced confession  video that included several of the detained Instagram users, including Hojabri. A silhouette image of Maedeh Hojabri crying and confessing to posting videos of herself dancing on Instagram on the national broadcaster. Video of IRIB documentary on Instagram arrests in Persian. According to Article 638 of Iran’s Islamic Penal Code , dancing is considered a “sinful act” and can be punished with two months imprisonment and 74 lashes (see the full details of Article 638 below). Similar charges  were brought in May 2014 against several Iranians who made and shared a fan-video  for the Pharrell Williams song “Happy” on social media. The forced confessions contribute to long-standing concerns regarding violations of due process in the country’s judicial system, and the use of the state broadcasting system to promote government narratives on arrested human rights defenders, journalists, academics and social media users. IRIB broadcasts have previously been used to promote conspiracy theories against dual nationals  Nazanin Zaghari Ratcliffe and Seyed Kavous-Emami. In a 2014 report, the Center for Human Rights in Iran demonstrated how forced “confessions”  are often extracted under the threat torture, and then broadcast by the state-run IRIB media to justify politically motivated prosecutions. Since December, Iranians have faced new hurdles to accessing the internet and engaging in online speech — there have been shutdowns of foreign traffic, censorship of the widely used Telegram messaging platform, and many arrests of social media users, journalists, activists and human rights defenders. In reaction to the judiciary’s statement that Instagram would be filtered, Rouhani’s Minister of Information Communications and Technology tweeted that these were false rumors. Instead, he said the unfiltering of Twitter, which has been blocked in Iran since 2009, is the real consideration. The issue that’s been followed for the filtering of various Internet services is not new. The unfiltering of of Twitter is in line to be discussed in the next meeting of the working group to determine offensive content. What’s new in this is the discussion of this irrelevant news by certain media to distract public opinion from the issue of transparency in the matter of currency devaluation. Similar statements were made by this Minister in the weeks before the Judiciary blocked Telegram in late April. Rhetorically, the Rouhani administration has long argued for greater freedoms of online. But the events of recent months make these promise ring hollow. Note – Women, who appear in public places and roads without wearing an Islamic hijab, shall be sentenced to ten days to two months’ imprisonment or a fine of fifty thousand to five hundred Rials.